While commercial real estate outlook remains strong in 2018, leading economist predicts that prices will be at a standstill. 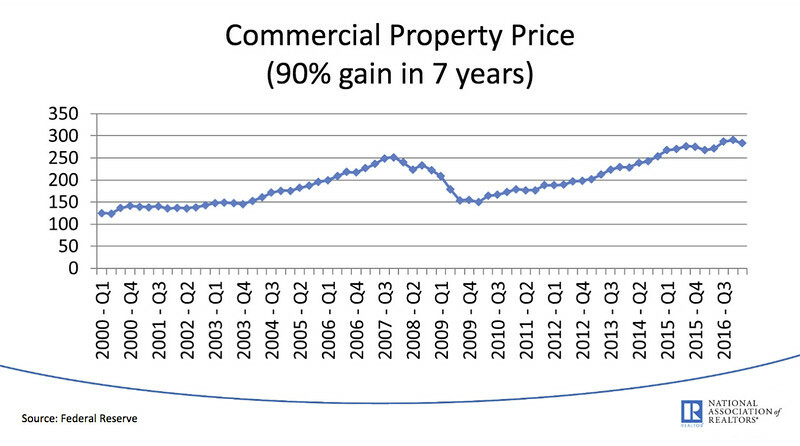 Commercial prices will plateau and may fall in large markets, but secondary markets will experience sustained demand and stable real estate prices, according to Lawrence Yun, National Association of Realtors® chief economist. Yun and JLL Chief Economist Ryan Severino both expressed confidence that the commercial sector should remain on an upward trajectory, but buyers and sellers could be at odds over price. “The commercial market should expect a standoff between buyers and sellers over price in the next year, which could lead to fewer transactions. Buyers cannot offer low cap rates because of rising interest rates, and sellers cite the strong economic climate as a reason for high prices. Furthermore, vacancy is falling, yet construction has been lagging because of worker shortages,” Yun said. Despite rising wages and record demand, the construction industry still faces shortages in available labor supply. 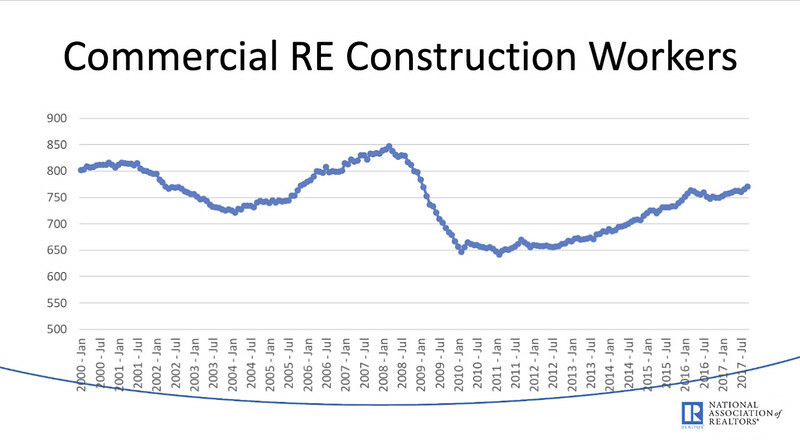 This chart indicates that the supply of labor for commercial real estate construction has yet to eclipse previous highs set in 2001 and 2008. Labor costs are squeezing the proformas of many infill projects across the country. Yun expects GDP to come in around 2.2 percent for the year and to expand to 2.8 percent overall in 2018, as long as job growth remains solid and construction picks up in both residential and commercial sectors. 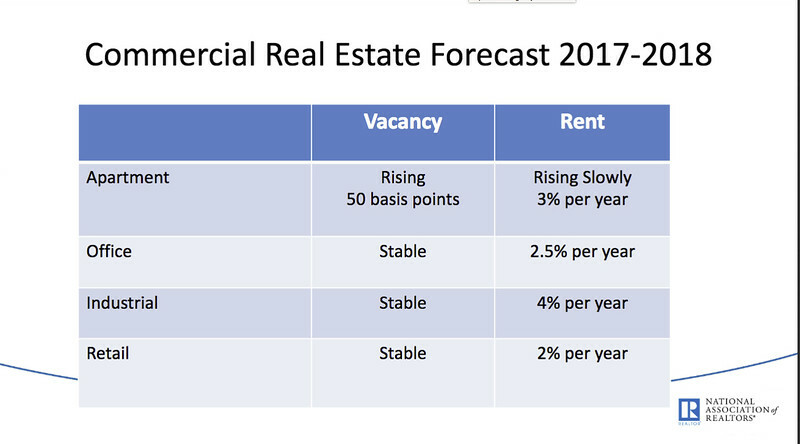 National office vacancy rates are forecast to remain fixed over the coming year with rent rising at 2.5 percent per year. The vacancy rate for industrial and retail space are expected to also remain stable with rent rising slowly at 4 percent and 2 percent, respectively. Even as new apartment completions bring more supply to markets, the multifamily sector will likely see a vacancy rate remain steady, with rent rising slowly at 3 percent per year. Supported by the ongoing stretch of outstanding job creation since 2010, commercial real estate and vacancy rates, in particular, are expected to be stable across the country. Warehouse vacancy will continue to decrease because of a strong appetite for industrial space, specifically ecommerce and trade. Yun went on to say that high-tech company expansions, such as Amazon, will have a large effect on regions across the country. “Depending on where these secondary headquarters land, nearby property owners will experience robust growth and property prices, but renters will indirectly feel a pinch of much higher rent payments,” Yun said. Severino joined Yun onstage and delved into the global economy and the performance of major property types. “Global economic growth is accelerating, and 2018 sees the world’s economic trains running strongly together. Interest rates are also going up but remain low by historic standards,” Severino said. He anticipates a strong performance from all sectors of commercial real estate, with supply starting to catch up with demand. “It is important to note that commercial practitioners may be getting too comfortable with the large demand for construction and the great performance of the industrial sector. Furthermore the suburban market is seeing more activity compared to downtown,” he said. Yun also highlighted the current tax reform plan in front of Congress and the impact it may have on the commercial market. “The industry holds the 1031 like-kind exchange sacred and, currently, it is included in the tax code plan for commercial real estate. This is great news for commercial practitioners and for the industry at large,” he said.